Peel the sweet potatoes, and cut it into cubes. Toss in 1tbsp of oil, the smoked paprika, and a little salt and pepper. Spread out into a single layer on a baking tray, and roast for around 35 minutes at 400°F, until soft in the middle and slightly crispy on the edges. Meanwhile, remove the tough stems from the kale, and cut the leaves into strips. Heat the remaining 1tbsp of oil in a large frying pan, and add the kale and garlic. Cook over a medium heat for a few minutes, then add the cooked quinoa and pecans. Cook for a few more minutes so that they can absorb the garlicky flavours and become slightly toasted. 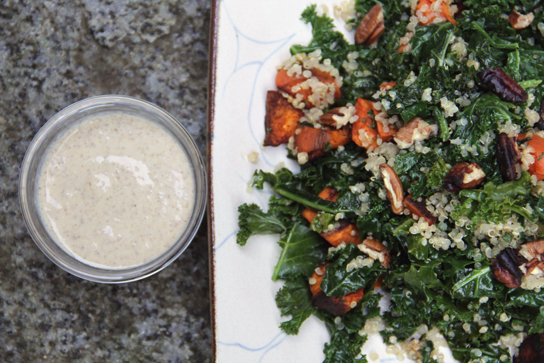 When the sweet potatoes are ready, add them to the quinoa and kale, and mix well. Mix in the dressing. Serve warm. Blend all ingredients until silky smooth in the blender. 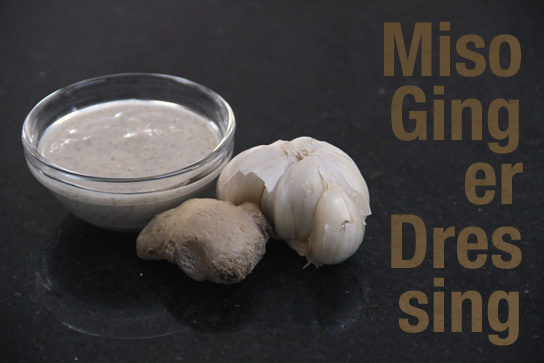 Set aside for 10-30 minutes, giving the chia seeds time to expand and absorb some of the dressing. You can control how thick you want your dressing to be by adding more water. That looks really good and really nutritious. One of my many favorite creations… 🙂 so tasty and easy to make! Enjoy! Gotta love a variation on a vegan classic. Yours looks great!